DC Young Fly is on top of the world with his over 3 million followers, and his fame is growing with every one of his posts. However, when this social media influencer crosses the wrong computer geek, all hell breaks loose and DC wakes up to find all of his followers are gone! This catastrophe couldnt happen on a worse day! DC has a career-changing audition, and he actually needs at least a million followers to even get in the door. DC has one day to gain his followers back, and make it to his audition. Immediately, DC enlists the help of his best friend Theo, the neighborhood tech genius, to help him to regain his followers. DC receives DMs from a mysterious Simon sending him on a variety of comical tasks, doing favors for his followers, and soon realizes that he is responsible for taking his followers. With every hilarious occurrence, DC realizes his social media influence and that those who follow him are real people. 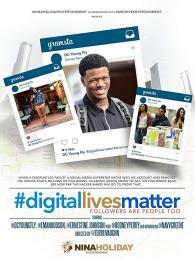 By the end of the day DC learns that Digital Lives Matter.